"Cold War", by Oscar-winning Polish director Pawel Pawlikowski, will open the 24th Sarajevo Film Festival (SFF) on Friday, the largest film competition and industry platform in a region stretching from Vienna to Istanbul. Launched in 1995 as an act of defiance towards the end of the 43-month siege of Sarajevo by Bosnian Serb forces, the festival has become a beacon of the Bosnian capital's cultural survival, drawing thousands each year. The remains of 35 Srebrenica genocide victims were placed on a truck laden with flowers in the Bosnian city of Visoko on Monday morning for their final journey to a cemetery. 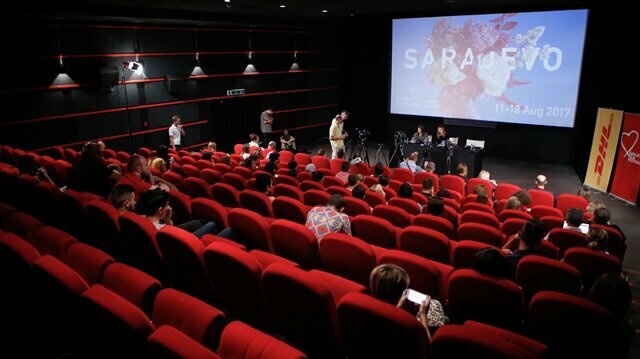 "For an independent film fan like me the festival is a fantastic opportunity to see the best productions from the region and beyond," Biljana Savic, the Sarajevo-born Director of The Academy of Urbanism in London told Reuters. The SFF's focus on the promotion of authors mainly from eastern and southeastern Europe has boosted cooperation between the Balkan countries that fought each others during the wars in the 1990s, creating a platform for reconciliation through art. This year, a record 266 films from 56 countries will be shown, of which 52 will have their world premiers, SFF Director Mirsad Purivatra said. Pawlikowski, who won best director at the Cannes Film Festival for the love story 'Cold War', is not the only Oscar winner in attendance, with Iranian film-maker and screenwriter Asghar Farhadit, twice an Academy Award winner, chairing the international jury. The annual festival attracts thousands of visitors each year and has a significant impact on the local economy. An independent study by British consultancy Olsberg SPI said that SFF generated $30.8 million for the Sarajevo economy last year. Wednesday marks the 15th anniversary of the death of Alija Izetbegovic, independent Bosnia’s first president and a pivotal figure in the troubled history of the Balkans.Izetbegovic -- a politician, writer and lawyer who came to international prominence during the country’s bitter 1992-1995 war -- is commemorated every year on his death anniversary.Often dubbed the "Wise King", Izetbegovic managed to gain independence for his country on March 1, 1992 - months after Slovenia and Croatia broke away from the former Yugoslavia.Izetbegovic died in Sarajevo on Oct. 19, 2003 of natural causes, having served as president of the Republic of Bosnia-Herzegovina from 1992 to 1996 and as chairman of the Bosnian presidency until October 2000.It was in Izetbegovic’s Islamic Declaration, published in 1970, that Bosnian independence, national consciousness and the expansion of Islamic thought found an audience.The book dealt with the relationship between the West and Islamic world and how to build a new civilization.His writings got him in trouble with the Yugoslav authorities. Along with 12 other Bosniak scholars, he was jailed for 14 years after being accused of "separatism and establishing an Islamic state" in 1983, but was released in 1988.He entered politics the same year and founded the Party of Democratic Action (SDA) in 1990 -- aiming to empower Bosniaks in their own land.Being one of the six republics of Yugoslavia, Bosnia's SDA won 86 seats in the 240-seat parliament in 1990's first multi-party elections.In February-March 1992, a referendum on independence for Bosnia-Herzegovina was held, in which 64 percent of its people participated and voted 99.44 percent to become independent.A month later, the European Union and the United States recognized the new state.Galeri: Bosnians honor Srebrenica victims with flowers and tearsGenocideHowever, the then-political leader of Bosnia’s Serbs, Radovan Karadzic, rejected the result and was the political face of an armed campaign which culminated in ethnic cleansing, a return to mass murder in postwar Europe.But neither during the ensuing war nor during the 1995 Srebrenica genocide of thousands of Bosnian Muslim men and boys did Izetbegovic lose the spirit of resistance.Support for Izetbegovic and his government came from some unexpected quarters. In the U.S. one sporting megastar was moved by the suffering of Muslims thousands of miles away in Europe and began rallying support to stop the suffering.Muhammad Ali -- the internationally famous boxing star -- lent his support to Bosnia’s campaign for international aid.Ali went to the UN on behalf of the people of Bosnia-Herzegovina. He was welcomed by Muhamed Sacirbey, Bosnia's first ambassador to the organization at UN headquarters in New York.From that time, only one photo remains -- Izetbegovic embracing Muhammad Ali.Ali did not speak to the media at the time, but the image remained a powerful symbol of resistance.Galeri: Bosnia releases balloons to commemorate martyrs of Turkey's failed coup‘We will not be slaves’In November 1995, Bosniaks -- amid international pressure -- stopped the war and signed the Dayton Agreement, bringing peace to the country.After stepping down as chair of Bosnia’s presidency in 2000, Izetbegovic lived alone on one floor of his house in Sarajevo.Izetbegovic’s physician, Dr. Enver Raljevic once said the former leader had a lot of visitors, including the High Representative of the European Union to Bosnia and Herzegovina Paddy Ashdown and Sulejman Tihic, chair of the SDA party founded years before by Izetbegovic. "After saying to his family that Aliya's death was approaching, Turkey’s Recep Tayyip Erdogan visited him. The strength he had during Erdogan’s visit was unbelievable," said Raljevic.Leaving a flag to his country, Izetbegovic died eight years after the Dayton Agreement was signed, in 2003.The death of Izetbegovic was bitter news and media headlines from that time are proof of the sadness and mourning shown by the Bosniak people: "He was the father of the people"; "Without Aliya, Bosnia and Herzegovina would not exist"; "Man of Peace dies"; and "Thank you, President".As per his request, Izetbegovic’s remains were laid to rest in the humble Kovaci area of Sarajevo, with the words "I vow to God -- whose strength is above all -- we will not be slaves" on his gravestone. "If we forget the genocide done to us, we are compelled to live it again. I shall never tell you to seek revenge, but never forget what has been done," Izetbegovic once told his people. "To become the teacher of the earth below, one has to become the student of the sky above. Law is not only my profession, but my preference of living and my life's motto.“We won't seek our future in the past. We won't run after grudge and revenge." Turkish Airlines (THY), Turkey's flag-carrier air company, has become the designated airlines to take Bosnian Muslims to Saudi Arabia for this year's Hajj pilgrimage, the airlines said Wednesday.A first of group of 215 Bosnian pilgrims will set off for Medina on Thursday with nearly 1,500 more Bosnian pilgrims to follow in the days to come.THY is stepping in to replace the Nevada-based Vision Airlines after an agreement between the U.S. charter company and Bosnia's pilgrimage organization broke down, leading to the cancellation of the flight of the first batch of pilgrims Wednesday.